In a raft of smartphone announcements at IFA 2018, next on the list is from HTC with the U12 Life. The U12 Life is the more mid-range version of the U12 family, which also contains the U12+ that was announced in May. The new smartphone still goes big with a 6-inch 2160x1080 display, with an 18:9 aspect ratio, and no notch as smartphones used to be. At the heart of the U12 Life is the Snapdragon 636, with eight Kryo 260 cores and an Adreno 509 GPU, placing it firmly in the mid-range. This follows through with the cameras, upgraded from the U11 Life with a dual rear camera (16MP + 5MP, f/2.0) and a front camera (13MP f/2.0). HTC has put a focus on selfies here, offering a front camera LED flash. Other features of the smartphone include 4GB of DRAM, 64GB of UFS 2.1 storage, and an expandable microSD slot. 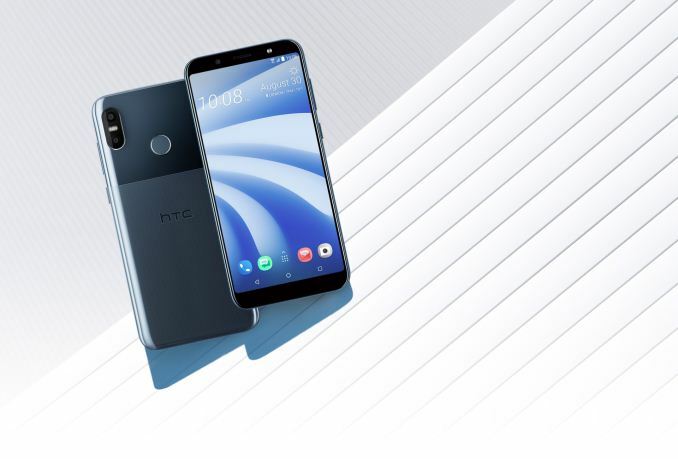 The fingerprint sensor is on the rear, which comes with the textured glass back on the bottom half of the smartphone for a two-tone effect – HTC calls this a dual-tone liquid surface. The battery is rated at 3600 mAh, with up to 10W charging, and will be offered in two colors: Moonlight Blue and Twilight Purple. The phone supports dual nano-SIMs with dual LTE, and has both a 3.5 mm audio jack and USB Type-C connection. The modem inside is good up to Cat 11, or 600 Mbps download. Other wireless connectivity comes via an 802.11ac module with NFC and Bluetooth 5.0. Pricing for the Life should be around 350 Euro, launching in EMEA later next month. We'll try and get a hands on while we're here at IFA. “The notch” is one of the most ridiculous trends in the industry ever. I have HTC10 that I like a lot. US market is tricky. Not only do you have the various bands and CDMA to contend with, but also the pricing model with subscription subsidies from the major carriers. You're pretty out of date (like years, think its already been 3 or 4 since they ditched that) on the pricing model for the US, they don't really do subsidies any more. You can get on payment plans where you pay the phones off in incremental payments per month, but that very much is not "free" or even touted as such (the only time would be situations like buy 1 get 1 free, where you get two phones, both billed to your plan but then getting credited for the cost of one of them each month).